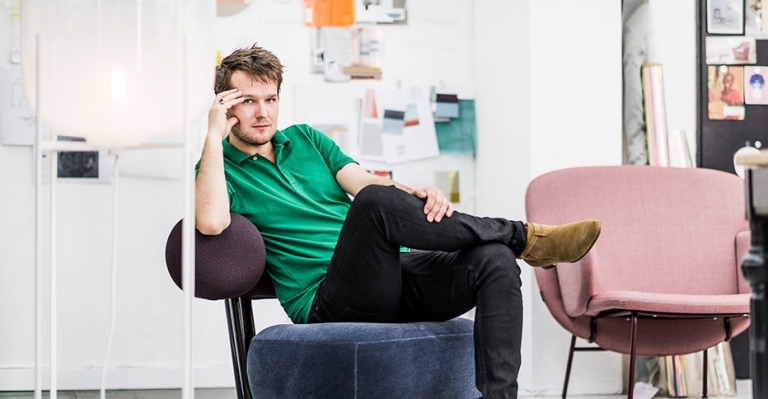 Here, we are in conversation with Sebastian Herkner, one of today’s most rising stars in design. He’s possibly best known for his sublime Bell Table but he could be viewed as a renaissance man of sorts. He has designed such a wide range of objects, from chairs to tables, baskets to lighting, installations, interiors, clocks, rugs, vases and even containers. As you browse through is collection, it’s hard to come across something you don’t like and in fact I still have yet to do so. Herkner has chosen to stay in the town where he studied product design, Offenbach in Germany, but he is always on the road, either lecturing, designing or visiting other countries to better understand their design and manufacturing processes, and be inspired. His studio is small but his reach is far, having collaborated with Moroso, ClassiCon and others. Here, he speaks about the beauty of combining that which may seem incongruous. Let’s talk a little bit about how you grew up. I’m really curious with everybody that I speak to, when you started realizing that design was important, when it became important to you? Did you have a special object in your home that you felt was designed or were you disenchanted by what was around you, that maybe made it interesting to you? I grew up on totally on the countryside in Germany, in a small village with 700 people and very slow tech so I was really outside growing up in the fields and the forests around. I think this was very important also for my work and I think in general it should be very interesting for kids also nowadays to go outside in nature, just watching the screens. It’s something for your fantasy, it’s something really for your senses also to get another experience to your real life outside. I think this was very important for my early career also to build outside really, to do something by hand because this is very important also for my work now. Like I explained, to do something with your hand to shape something, I think these are my roots and I’m not really from a family based in architecture or designs. It was really driven by my interest on vacations that I saw some design classics from Scandinavia and then we visited the museum to get in contact. That time in the 80’s and early 90’s, I had no really idea about this profession, or that it’s called industrial designer or product designer. At school also there was just, like doing fashion which was a fashion designer or an architect. This changed, thanks God, the last years and also in the news and in the society in Germany, that it becomes more and more important, what a designer is doing. Also related, of course, to the new technology to the smart phones, and tablets, and so on that it’s coming more and more important, the topic of design. I’m still more focused really on the product like furniture, lighting and accessories. We also starting now to really think about a place where people can feel comfortable and with nice products which become like companions for their life. This small 700 person town, it’s amazing it’s really small, I mean 700 people, that’s tiny. How long did you live there, and then when did you leave and what made you leave? Actually, I lived so far 50% of my life there, so 18 years and, of course, my parents are still there and for me it’s always very interesting to go back to see the difference to my city now where I live. Like Frankfurt in Germany or now I’m here in San Francisco or I just have been to Tokyo and other cities to see always these differences. They all have in common that we all have similar needs, for all life. It’s very interesting to observe the people in Japan, or in the small village, or also here at the west coast. What are their needs or how do they behave, sometimes there are differences, but nowadays more and more through globalization, we have more and more the same idea, and the same idea of freedom, and of our life. They are still the differences I can really catch and observe and with a good instinct and the interpretation there’s the space to create new things. You’re always creating new things, it’s incredible, how many different pieces there are. I love your website actually, I love how they just, as they’re loading they come up and you don’t know what to expect actually in those first few moments. Then suddenly a new piece comes and a new piece comes and think wow this person really definitely thinks about this a lot. Definitely has a lot in him. What was the first piece you made, not that became popular, not that was put into production, but for you? When you first designed something do you remember what that was, when you first designed something? Well, actually maybe it was not a design but I was really working when I was a teenager with a lot with materials, repairing things I found or put them together in a new typology, using two chairs to create another one. Things like this, so this was really my first contact and I think this is always very important to have this tests and to play with something to create something. At the end we work in a similar way, now we that we find a nice material, a new material, or we find a technology to create something with them, so it’s always about a curiosity and to have a challenge or to have a vision to create something out of it. Then to have the right partner who believes also in your vision and your idea and then it’s always a good starting point to develop a design. When you say partner, that’s not, you have an assistant but you don’t have a creative partner? I have a team we are four, five people in the studio, and then we work for now international clients. They ask us to do a sofa, or to design a sofa, or to design lighting, or ways, or even an interior. This is always the starting point, sometimes we have a concept or an idea and then we go forward to a suitable company we think this could match to the collection. How did you build your team? How did you choose who was the right fit for you? Well, I started directly when I did my diploma in Offenbach where I started, there’s also my studio. My studio was in the corner of my living room and it was 2006. Then it was growing step by step, with the first intern, this is like also some stories started here in a garage. It really started in a small space in the corner and then growing and then at the end, I just had the privacy in my sleeping room. The others was like a archive, or laboratory, or workshop for my designs. Three years ago I moved one floor down to a formal leather workshop for leather bags, because Offenbach was the center for handbag production in Germany. There I got this space and I moved and now we are five people together with me. Sounds like you have your own personal space to yourself, you’re not sharing your apartment anymore. Yeah, right I got it finally back. I was thinking about your space, is it filled with beautiful things, where you live, your home? My private home, yeah, well if it’s beautiful or not some people maybe say it’s too eclectic or it’s a little bit too messy. It’s not a white cube at the end, it’s really a mix from own designs, designs from colleagues, or designers I really appreciate and like. There are classic pieces there are also, pieces by a big Swedish furniture store, so it’s really a mix. This is very important, and a lot of souvenirs I bought on my vacations in Asia or South America or here, because I need all their things around me, and some of them are maybe ugly, some of them are nice, some of them became dusty because. This is okay, but it’s also with my design it’s not just about to do beautiful things, I think it’s more interesting to do things which are unique and maybe at the first moment you really have to stop and think about it. You have to really get in contact with them, and then the people later should decide if they like it or not. It would be too easy to do something which is like other things and then the people say, “Yeah, well it’s like this, it’s okay.” Sometimes it’s better to do something which is not so easy to understand, to give some energy to the product and then to get something successful. I’m always careful of telling someone whose shown me something they’ve created that it’s like something else, because while it’s not an insult, but you can always tell when you say that to someone, the look on their face just gets disappointed. They don’t want to be like something, they want to be theirs. I think my designs are sometimes imitating, and on the other side for me it’s very important always to put it upside down to go completely the other way. To swim against the river. It’s very important and plus it triggers new thoughts and I think that’s exciting. Now why did you stay in Offenbach, what made you decide to stay there? I know you studied there, and I know you started your studio there, but you could have moved. Actually I was also in the time between my pre diploma and diploma, I did a internship at Stella McCartney, so I used to live in London also for one year and really enjoyed the city. Now with the talks and fairs I’m really travelling a lot so, for me the best place is always where you feel really comfortable and home, and this is actually Offenbach where I studied. I have my boyfriend there, my friends there around and it’s a small city close by, really close there’s just a river between is Frankfurt, which is a city with 750,000 people. A little bit bigger than my village, and I really like it there and I can travel quite easily from this area and I think you don’t have to be in Berlin, Munich, New York to be more creative than in a smaller city. The most important thing is that you really feel well with yourself and comfortable and have your positive energy and friends around, and on the other hand we get so much impact by travelling around or from social medias and other things. Nowadays there’s no big reason to be in one of this very famous areas, and this is something I tell also students in China, or Thailand, or in Columbia which maybe have not the financial power to move to one of this big cities. It’s just important to have your own unique style to have your own design language, your philosophy, your power. You have to spend a lot of energy in it, but at the end if you use the right ways and nowadays with social medias you can get in contact with a lot of people worldwide. You have a chance to just have your success. Thinking about you speaking to students, it’s not that long ago you were a student yourself. You are so young in this field, I know that you’re in your early 30’s, but that’s still very young. Do you notice that, do you notice your age, do you notice being young? I was never interested really in the age, so I have a lot of friends who are in their 70’s. Which is very interesting, because nowadays the people who are in their 70’s are not like my grandparents at that time. I think we don’t need to think in these clusters, I think it’s really about communication and if you like someone it’s the best way. I was also thinking about the fact that, I think I had read that you had said that you need a quiet space to create. Living in a city would make it very hard to find that, but you need a quite space to really think about … to relate to design. It’s not just about the noise or the silence it’s also sometimes about a whiter space, white walls. In my studio, also in the flat, it’s sometimes it’s very colorful with all this stuff I’ve found in the shelves. Sometimes it’s good to have this white curtain to close in front of the shelf to have a white area to really think from the beginning and not to get some, all this information you see in the shelves. It’s really good to have a free mind to start to think about something. If I get a brief of a company, sometimes I get a idea in two weeks, or two days, but sometimes it takes two years, and I have to tell them, “No, sorry I don’t have the super idea, or the idea you need or I feel comfortable.” Deciding something is really about responsibility, it’s something which can change the society, you see, especially here like products created here, in the area that it’s changed our social life. Then designers like me have to interact also observe these changes, so a bed nowadays is something different than 20 years ago. Now we use a bed in other ways, it’s not just about sleeping, it’s also about working late, so when I go to bed I check the last emails on social media. I need to sit maybe, so I need a back wall or something like wood back pillow, and also our seating on a sofa, or a working desk changed with all these new technologies. There are still a lot of things to do, the thing about this, that’s why I can’t say we have enough chairs. New technologies, new materials, but also new behaviors with all this new surroundings or typologies on our working desks, needs new chairs and new ways of seating. I read something that you had said about chairs, that you really have to think about the environment within which the chair is. Like is it going to be in the cinema, is it going to be in your home, is it going to be in, you didn’t say this, but in a hospital, is it going to be in a kids room? Where’s it going to be, because every chair is going to be radically different based on the context? Even in a company there are different chairs. The secretary has another chair, then the CEO, or the person working or assembling somethings. Let’s talk about some of your pieces. Looking through them there were so many that I would have wanted. I’m actually pretty picky, so I was surprised. The glass table is so beautiful, and the colors are incredible. It sounds like you’re always adding new colors to that collection. What are some of the pieces that you love? I know that sounds like a crazy question for someone that designs, it’s hard to choose, they are like your children but what are some of them that stand out for you? They are all kids, so I can’t say that I prefer this one more than the other one, because some of them took three months, or two, others three years. They all have something in common, their approach for materials, craftsmanship, the mix of colors and materials, and that I know really where they are produced and how they are produced. In the case of the bell table, you mentioned, for German brand Clasicon it’s produced in Bavaria in Germany. Then I started to do design this table, I was thinking side tables and normally there’s a metal structure and there’s a glass plate on top. I wanted to say put it upside down, that’s why the base of the table is made of glass, and the top is made of brass or copper. You have different versions and sizes also, and this is something I do with other products as well, to put it upside down to get this irritation. To get something really unique and strong. For this table it was very difficult to find a glass maker, glass blower to produce this piece. Then we found this company which is more than 400 years old, and they are in 15th generation. At the end they just opened the workshops for school classes and people who were interested to see how glass production works, so it was like a stage or like in theater, they just did it for their visitors. Then I asked them if they can do it, and since that day in 2012, they produced this table, and the company’s growing, so it also has a social sustainability and benefit. That there’s this craft which has a new possibility now for this table, and a new avant garde design and I think this is very important. This is also something which made me very happy that I had this success also in this way. This I do also with other products, so I do products also in Columbia, or in Zimbabwe in Africa. Like in Zimbabwe I went there for two weeks, to the north in an area close to Binga, to work on baskets with 20 woman. There was no tap water, no electricity but there was really passion and they interested to do something together and this was really an incredible moment. How did that happen? How did you find them? What happened you were interested in basket weaving, just you were in Germany and you just suddenly, you thought wow basket weaving must amazing. Then what happened? I was invited by European Union to do a project there and I was really curious to do but on the other hand I was also nervous. To get in contact, there was of course the barrier with the language which was not easy, and really to stay there. Two weeks ago I was on the furniture fair in Milan, which is completely the opposite, it’s more or less a premium furniture show. Then you go to this very simple life in Zimbabwe. Then you really have to talk to them, respect their tradition and how they live, and they sell like two baskets a month and earn $12, and they use the money for their kids to go to school to learn some English. To get their education and the man they go into the field to have the corn and protect the corn from the elephants. Then I asked for colors, but there was nothing and there’s also no home depot you can go to buy something, and at the end they had not the money for this. I was looking for something which is easy to carry because some of the woman came 300 kilometers for this workshop. At the end I found this packaging, the rice packaging, which are these plastic fiber bags and we used this plastic fiber, so there were some bags with red, and some with blue. We used this and mixed it with the natural fibers to get a very colorful basket but still respecting their tradition and pattern. This was really great experience, they were super happy about this very simple idea at the end, to think in a new way about the tradition and baskets. It’s an amazing experience, I mean really amazing experience. Particularly the way you’ve staged it, that it was right after Milan, and all the fanciness of Milan, and the money of Milan. Then to come to something like that, I just wouldn’t expect it. Also it sounds like you were incredibly innovative, because since you didn’t have access to something you managed to find the materials that you needed in the bags of the rice. That takes some thinking. I think in this case it’s really important to find something they can really afford and they can carry. Every woman buys rice there, every two weeks maybe one of this big bags. They have the material, so they can recycle also in this way, this was very interesting then to develop this product, and on the other hand it was super interesting to see that the men wore the European soccer tri-colors. They knew about the European Championship in soccer, so it’s not like they’re really in the bush, they really know about international things. They also have their bank account on their mobile phone, which is not a smart phone a regular phone, but they can do their banking with the phone. Which was also interesting, we in Germany can’t do our banking with the phone, at the moment, it will change now. You really have this big differences in the country it was really fantastic to see and to realize. Wow what a highlight, pretty incredible for you to have really traveled the world before 40, coming from such a different background. That’s true I think travelling is really amazing, and I’m very thankful also to have this opportunity to go on one hand to the workshop, on the other hand to all these amazing cities to see. For a designer this is really the big pot with all the inspirations, and to see the mix of cultures and how cultures also mix like you can see here also in New York. Now I was invited earlier this year as guest of honor at IMM Cologne fair to do the Das Haus. Das Haus is a special installation about living, about interior. I did it this year, and last year it was for example, [inaudible 00:27:37] and other designers. For me it was very important not just to do a house, for me it was really more important to do a statement, because what I mentioned we have the responsibility but we can have really also the freedom, opportunity to say something. All the creative minds can do it. I wanted to do a house about hospitality about openness because in Europe, you know we have the crisis and the movement of refugees. This is really interesting, sometimes very sad, experience or situation now that you see, on one hand you see a lot of people welcoming them. On the other side you see the opposite because they are not curios or they have fear about their own future. I think we all need the curiosity and you see it in cities around the world that a mix of culture it works. The same is also for me as a designer, it’s so interesting to get the impact of other cultures to create new things. At Das Haus we did a house which was round, it was without strong walls. We used 600 square meters of curtains which were moving, changing the walls, opened the house, closed the house. It was about the perspective, the inside and outside, it was about the sensors. I wanted not to do a museum, I wanted to do really a space about communication where people stayed during the fair to communicate, to eat a soup we served. Really to enjoy the together, this was very important for me to have this statement. It’s very cool that you served soup too, it’s kind of universal meal is soup. What kind of soup was it? That kind it was a typical dish from Syria, so connected to refugees, and the soup also because of the sense of taste and smelling something, which was very important for me. To touch all the sensors, not just seeing and feeling, also to taste something, to hear something, and to smell something. There was also something very special which was a small highlight of sensors house, about smelling, it was the walls in the bathroom were covered with soap tiles. This is related to more or less to my studio because close to my studio there’s a soap manufacturer producing soap for discount shops in Germany. When we have lunch outside with my team, or barbecue with my friends in the evening, you can smell the daffodils one day and the other day you can smell the roses. I wanted to bring this experience to Das Haus so I asked the company if they can produce a special brick or tile made of soap, and we covered the two walls of the bathroom with the soap. It was very interesting also to watch the people walking by, because just maybe 30, 40% realized that the smell came from the soaps, from the wall. They thought it’s maybe a fragrance, just from the supermarkets or fashion stores, which has the special fragrance. Then they really enjoyed this experience that the smell came from this wall, and here I always mention, yeah this is something really do you have to remember you have to save in your head. You can’t take a picture, you can’t post it, because nowadays we go to concerts taking pictures, or just staring through the lens or through the mobile phone and we don’t listen and watch the concert. This is something really like with the soap, you have to remember and have to tell, you can’t save it. I think this is an aspect which is very important nowadays, because we have this simple opportunity now with a smart phone to click, click, click to take pictures. We don’t train or and use our head that much anymore. Smell is one of those things, you smell something and you know you remember something from 20 years ago. Even from your early childhood it just comes back. Exactly, smell is something very special, it’s always connected to a sutiaton or to a person or to a material. I still remember the fragrance of my grandmother, which was also something to throw, so really if I smell this it connects me really to the situation with her and in my experience with her. I think this is something we don’t use that much anymore, to smell somethings, we train more our sensors like to watch or to feel something. I think it’s very special the sense of smelling. It’s great to incorporate that as a designer. You went to ICFF, is ICFF inspiring? Of course, ICFF is also inspiring it’s another fair, it’s different to European fairs because the American style is different. The America interior style is different, and it’s inspiring it’s also for my point of view, it’s really growing it’s getting better and better. You have a lot of these small workshops and young designers from Brooklyn or from Washington showing their crafted things, lighting’s. You have the established designers like Lindsey Edelmann doing this amazing chandeliers, so I think it’s very interesting to see and I really like also that there are differences to European style or also Asian style which are important. I don’t want to have the same designs through everywhere, so this makes it more interesting. On the other hand European design is very important and successful also here in the States. Europe maybe is more the country for the crafted things and here it’s more the technology, coming from here spreading over the world. Worldwide you have this technologies developed here but on the other hand you have this furniture and crafted things [or pens 00:34:40], or whatever, all the cars produced in Europe. So not what’s next, like actually what’s next, what’s happening, what’re you making next, but what dreams do you have next for yourself? Not what deals do you have with Clasicon, or any other company, but what do you have for yourself dream wise? We’re working a lot with new companies, we’re doing also first interiors, which I really wanted to do. To think about the whole concept, about we doing department stores at the moment for example, so this is really something I really enjoy now with my team. On the other hand I want to travel the world to see different cultures, really to go this year to Japan for a holiday. To go another time to Africa which is an amazing continent because you see the milky way, which you can’t see here anymore, not really because you have this light pollution. Maybe if you go here to a desert on the way to Los Vegas maybe you can see it if there’s no light. This was really something amazing to see it, so really to travel and to experience the world, and cultures, and people and different kinds of foods and music.